Data miners often have an objective of exploring sets of data to determine meaningful patterns which can then be modeled for predictive patterning, hopefully to help meet their organization’s end goal(s). However, there may be a time when the end behavior is not inherent in your database. Such a situation recently came up for my Advancement organization. Our prospecting team recently started a program wrapped around peer recommendations: A prospect recommends new suspects to us based on the prospect’s interactions with the suspects. The question then became, what can we provide to the prospect to help get them thinking about potential suspects? We currently do not have any type of data which would allow us to say, “Yes, this is what a relationship looks like,” outside of family relationships. We had to find a different way to identify potential acquaintances. I looked back at my own relationships to determine how I know the people I know. My friends and acquaintances largely come from some basic areas: school, work, places I’ve gone, etc. Transforming my experience with relationships into what we have for useable data, I saw three key areas where relationships may exist: work history, education history, and extracurricular activities including one-time events. Fortunately, I was able to pinpoint our constituents’ time in each of the above areas to help isolate meaningful, shared experiences amongst constituents. Our work and extracurricular history includes to/from dates, and we have loads of educational history data that includes specific dates. Using this data, I am able to come up with potential relationships from a single prospect. Those employed by the Widget Factory who started before John ended, and ended after John began. Those students who participated in Football and had a class year within +/-3 years of John. Those students in Student Senate at the same time as John, similar to the Widget Factory example. Those students who were in the same class year as John. Those students who share John’s major. Currently,since I have no way of proving the value of one point of contact over the other, each row returned in the potential relationships earns the constituent one point. Since my database stores historical records, I may get more than one row per constituent in any one category if they met more than one of John’s associated records – say they participated in Student Senate and played Football. This is great, because I want to give those particular constituents two points since they have more than one touch point in common with John. I end up with a ranked list of constituents who share potential relationship contacts with my main prospect. The relationship lists provide our prospect researchers a starting point in putting together a solid list of high capacity constituents a single person may have some sort of relationship with, thus a greater insight into potential giving. As of now, the report is in its infancy but looks to have high potential. As we grow the concept, there are multiple data points where further exploration could result in a higher level of functioning. As prospects use the lists to identify people they know, we can then deconstruct those choices to determine what is more likely a relationship. Should shared employment be ranked higher than shared class year? Should Football rank higher than Student Senate? I would guess yes, but I currently do not have supporting data to make that decision. Another interesting concept, raised at the recent DRIVE 2011 conference, would be: “How are these two prospects potentially related by a third constituent?” The result could mean the difference between two separate, forced conversations and one single conversation with three prospects shared over nostalgic conversations, drinks and, hopefully, money in the door! Erich Preisendorfer is Associate Director, Business Intelligence, working in Advancement Services at the University of New Hampshire. But can it be useful for fundraising too? If you look at NodeXL from a fundraising perspective you immediately see the correlation. NodeXL is designed to be a discovery tool for discovering deep connections in your social networks. This in itself is pretty useful, especially if your fundraising department is heavily involved in social media (and it probably will be at some point). This tool helps you discover who is having an impact on your social reputation. But let’s put that aside. Even the most basic of fundraising offices are constantly looking to find new connections to and between donors. Who knows who that can provide me with an introduction to Mr. X? Depending on the size and complexity of your database (and your staff) these connections are often easy to miss. Sure, we may note that Bob and Jim sit on the same board or work at the same company, but going a layer deeper than that is often problematic. With that in mind, I began to explore NodeXL. There are a couple of things that are appealing about NodeXL. First, it’s free. It downloads as a zip file and operates essentially as a macro plug-in for Excel 2007. But this is unlike any macro you’ve ever seen. The visual capabilities are stunning. Secondly, it is relatively straightforward. While it does have some extremely powerful advanced features, it’s relatively easy to get started. These two columns of data are all that NodeXL accepts and needs to do network analysis. The rest of the work, calculating connections between these relationships, is done for you. I think you can get the picture. The I and O appended to the front are for facilitating sorting (if you should wish to color code them later you can easily sort the organizations from the individuals). As you might expect, this query returned a couple thousand connections. But I was pleased NodeXL handled them so efficiently. The resulting graph (Harel-Koren Fast Multiscale format) was visually stunning. Stunning? Yes! Useful? I wasn’t sure yet. 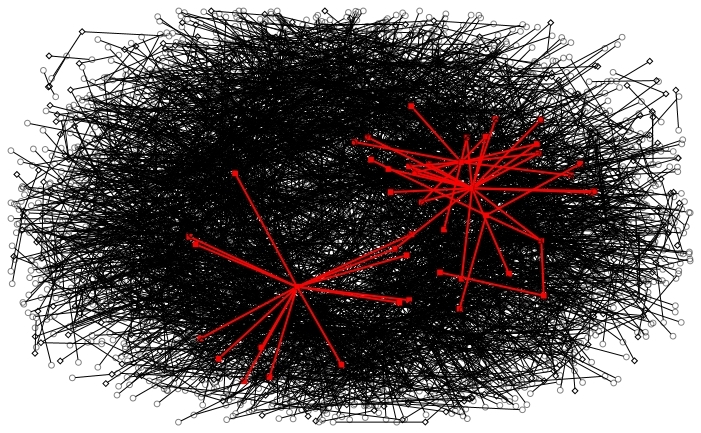 I knew that I could isolate an individual within this huge graph. The highlighted green line above, for example, is one of our major donors. I decided to leave this dataset behind for a bit and move to more of a discovery project. We are very fortunate to have completed a full database screening a few months ago. I turned my eyes towards the data we received from our vendor that includes a table of people in our database with connections the vendor discovered to foundations (based on GuideStar data). I created an edge list from this data that resulted in 4,872 relationships. 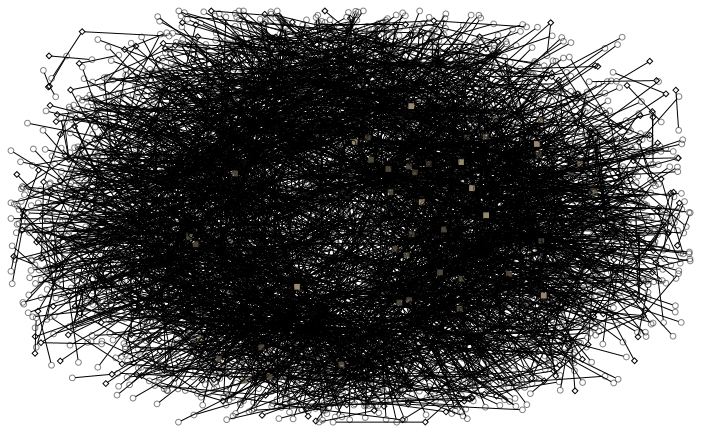 The resulting graph (Fruchterman-Reingold format) returned a huge blob. 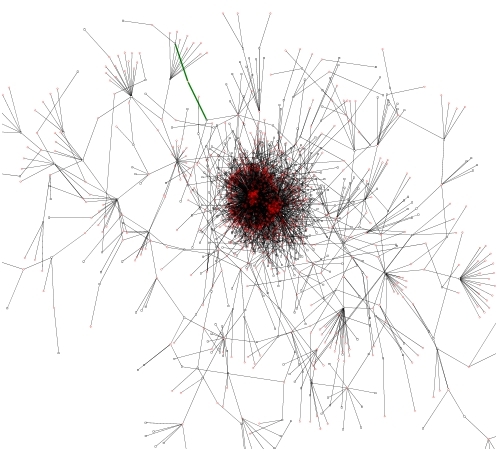 You can click around on a graph like this to isolate individual connections (or edges) and try to do some discovery this way, but in a graph as dense of this it is basically impossible. But the other way to do discovery work is to pose the question from a certain perspective. For instance, I highlighted in the edge list two particular closely related foundations. I then used the subgroup option in NodeXL to select all of the vertices four layers deep, meaning let’s look at relationships between individuals not just directly to the organization, but let’s dig a few layers deeper. You can see from the graph below the highlighted connections from the larger mass. I then extracted these selected vertices into a brand new NodeXL sheet. After adding some labels, you can reduce the useful information to just a few connections. What can we tell from this graph? It is likely that the connection between Al Winner and Steven Cook was already known and well documented. But the real advantage here is seeing the tangential connections we may have missed. Steven Cook has a potential relationship with Charles Talor. 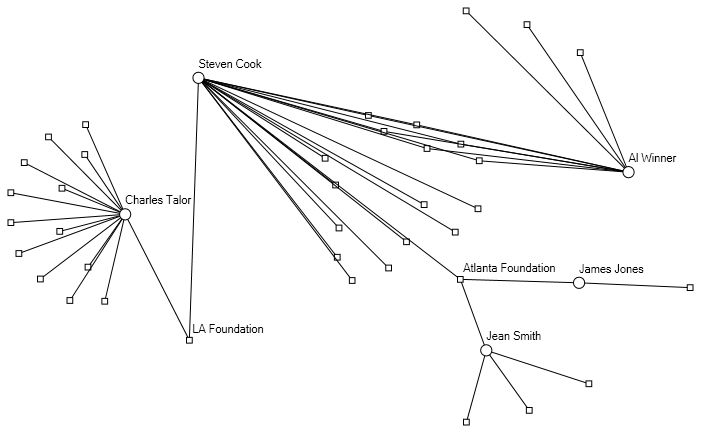 Indeed, in our database Steven Cook is a well known alumnus, while Charles Talor is someone we would like to know. So a potential for establishing a relationship is provided. The same holds true for potential connections to James Jones and Jean Smith. While some of these connections may be known, the advantages to visualizing them are great. Potential connections jump from the page. What I have discussed is scratching the surface of this advanced tool in only a cursory manner. I have very little knowledge of network graphing beyond what I’ve read online. Yet with NodeXL I have been able to produce some simple but powerful graphs. Relationships as they are defined in fundraising databases are very different from those that can be extracted from complicated social networking data. And yet there are similarities. As I begin to delve deeper into this tool, it is forcing me to rethink how we have relationships defined in our database, think about existing data that we have that might be useful in a visual format, and think about the future where we will certainly want to supplement our traditional alumni data with information from social networks. What is this? Find out next week. Relationship mapping is a side-interest of mine, one which I’ve only rarely been able to apply in my work. In major-gifts research, I’ve used software to map connections between prospects via the corporate and non-profit boards they sit on together, to create visualizations that are similar in appearance to Muckety, TheyRule and other online apps. These visualizations were half exploratory (searching for the best point of entry to a prospect) and half illustrative (as in showing likely points of connection in a briefing memo). Naturally I was intrigued by NodeXL, an Excel add-on which makes it a snap to visually portray the relationships between and among hundreds or thousands of entities at once. Unlike the products David reviews, NodeXL works exclusively with the data you feed into it. It’s cool, it’s free, it’s easy to use, and it’s been on my list of blog post ideas for months. I have played with it a bit, creating a visualization of the cross-references in our database. The result looked like a giant knot of black spaghetti. I thought that was cool, but doubted anyone else could be convinced of its coolness. I didn’t find an application for it at work. I think Jason Boley at Purdue has, though. (Twitter: soam) He’s worked with it a lot more and taken it far beyond what I was able to do. His explorations will be of interest to fundraising shops, so a little while ago I asked if he would contribute a guest post on the topic, and he has obliged. Read it here.